“Allgemeine Bäckerzeitung“, supplied this “seedy” bread for my “Equal Opportunity Baking” list. A heavy weight, scaled for 21 loaves, with selling points, marketing tips, production cost and time calculation, including sales tax (7%) and even a suggested retail price (1.83 Euro). The production steps are briefly listed – no need to explain to professionals what they do every day. Scaling the ingredients down to home baking proportions was not difficult (a minimum of 3 loaves), and the instructions, though brief, were precise, and didn’t overtax my mental capacities. The recipe said (more or less) only: “make a dough”. I tried to stretch and fold it, but that didn’t work too well, the dough was too wet. Therefore, instead of soaking only the flaxseeds in hot water for 1 hour (original recipe) I would include some of the flour in the soaker, to have a larger preferment, and more water already absorbed in the flour. 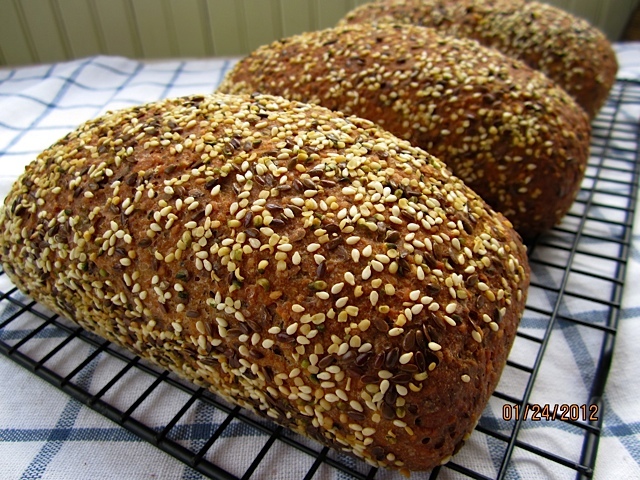 The Bäckerzeitung says: “roll the shaped loaves over a wet towel, and then dip them into the (topping) seed mixture”. Though this coated the breads nicely with seeds, they didn’t stick well enough, and a lot of them fell off during and after baking. Next time I would brush the loaves with egg white, instead of just moistening them with water. In the morning, stir together all ingredients for soaker, cover and let sit at room temperature. Mix all ingredients for starter (in 1-step), cover and let ferment at room temperature. In the evening, mix together all ingredients for final dough for 1 – 2 minutes on low speed. Knead on medium-low speed for 4 minutes (or knead by hand). Let dough rest for 5 minutes. Resume kneading for another minute (dough will still be somewhat sticky). Divide dough into 3 portions, place in oiled containers, cover and refrigerate overnight. Remove dough from refrigerator 2 hours before using. Shape into sandwich loaves, or bâtards for free standing loaves. Brush breads with egg white, and then roll over seed mixture. Place breads in oiled loaf pans, if making sandwich loaves, or bâtards on parchment lined baking sheet (no scoring.) Mist with spray oil, cover, and let rise for 45 – 60 minutes, or until they have grown 1 1/2 times their original size. Preheat oven to 240ºC/465ºF, including steam pan. Place breads in oven, steaming with 1 cup of boiling water. Bake at falling temperatures: 10 minutes at 240ºC/465ºF, 10 minutes at 220ºC/428ºF, then turn loaves out onto baking sheet, remove steam pan and continue baking for 10 minutes at 200ºC/400ºF, and 10 minutes at 180ºC/355ºF. The internal temperature should be at least 200 F/93 C.
Let breads cool completely on wire rack before slicing. Update: I made them again, this time with chia instead of hemp seeds, and as free standing bâtards. With flour included in the soaker, it was much easier to handle the final dough. Brushing the loaves with egg white worked much better for the seed topping than the wet towel method. I love your blog. I'm about to bake this recipe but there are couple of things I don't get. When you say to grams of anise coriander and caraway do you mean two grams of each or 2 grams of the total? also, should the chia seeds go in the soaker? And lastly, does the recipe you posted reflect adding flour to the soaker as your comment at the end mentions?I'm about to bake this and I will let you know how it comes out. 2 grams of the total. For German bread baking I keep a mixture of equal amounts of anise, caraway and fennel in a jar, so that I can measure them together. The coriander I keep separate, because it's not always added to the spice mixture. Do you mean the hemp seeds? You can exchange them with chia, if you have those at hand. No, those are not added to the soaker, only the flax. Flax seeds can't be digested if not really well soaked, whereas hemp seeds (or chia) have enough time to soak in the final dough. My recipe reflects my changes to the original formula. I just baked this bread two weeks ago for my customers, and it turned out really nice (don't forget the egg white brushing to make the topping stick). I'm always happy to get some feedback, if people tried my breads. 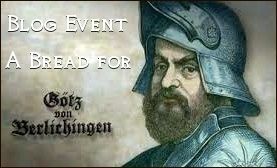 the bread is in the oven as I write. I noticed that my bread does not rise to 1 and a half Times the volume. I think this is due to my rye flour. I grind it fresh from whole grain with a Wolfgang Stone grinder. I noticed you said medium rye. I guess mine is more of a whole grain pumpernickel and this is why it is not rising. Am I correct about that? Yes. Made with whole rye, the bread will not rise as much and be denser. But I'm sure it will taste very good, too. 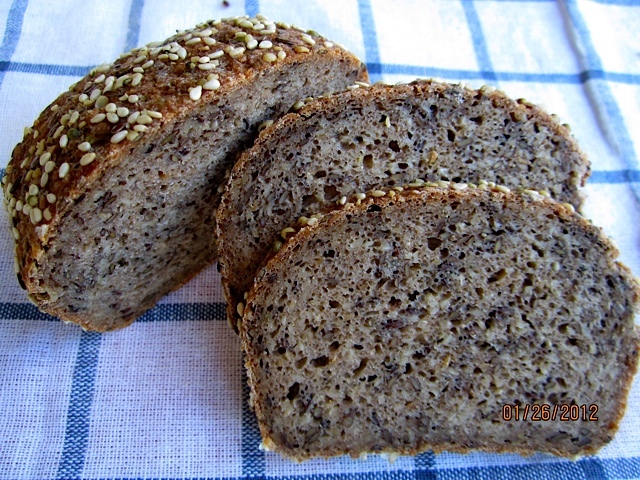 Medium rye – a mainstay in German mixed wheat/rye breads – is not readily available in the US. I ordered mine from Honeyville, King Arthur and NYBakers carry it, too. If you grind your flour yourself, you can try to sift out some of the bran. I converted a lot of German recipes for American ingredients, and sometimes, when a substitute tastes a bit different, but good, too, I stick with it – taste rules! Did you manage to roll it in the seeds, nevertheless? Please, let me know how you like your whole rye version.